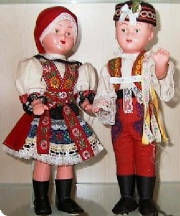 The traditional Pheasant costume of Hungary is very decorative. The women show their industry in embroidery on their own clothes and on their men folk. 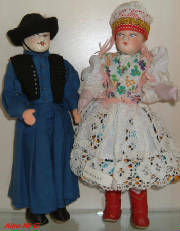 Their colourful skirts are ankle or knee length and are worn over several petticoats. 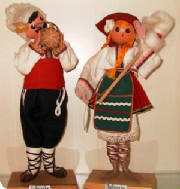 Their blouses have puffed or long full sleeves, a long black apron of silk or velver reaches the hem of the skirt and is heavily embroidered with flowers. 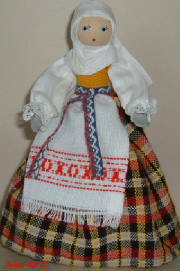 On the head is a tight scarf on to which is fitted large colourful woollen pom poms. These dolls are a type of hard plastic, approx. 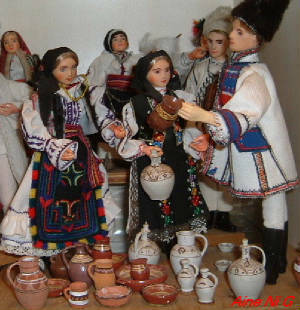 9" high and come on a wooden stand, they are made by "Arta Crisanei" the handicraft Cooperatives from Oradea. 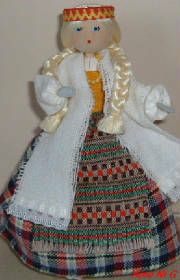 This Co-op make dolls to represent all regions of Romania, and to represent everyday life in Romanian villages. 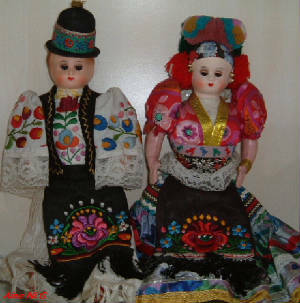 Not only do they reproduce the genuine costume of the region, but also the specific customs and occupations of the regions.